Middletown City Schools opened their 7-12 campus in time for the first day of school. Photo Credit: Fanning Howey Associates. 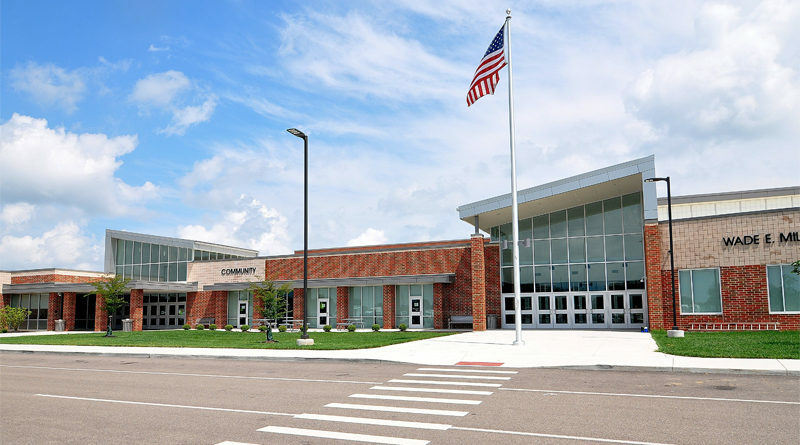 MIDDLETOWN, Ohio — A $96 million construction and renovation project for Middletown Middle and High schools recently wrapped up, giving students an opportunity to begin the first day of the school year on a new conjoined campus. Now dubbed as the Middletown City Schools 7-12 Campus, both schools are adjacent to one another, with the new middle school built on the same campus as the renovated and expanded high school located at North Breiel Boulevard. According to the Journal-News, classes at both schools opened smoothly for 6,300 Middletown students across the Middletown City School District after its usual August opening was delayed to allow additional time to finish the new campus for grades seven through 12. “The district’s goal was to revive an outdated high school building and transform it into a facility that allows students to learn in a higher-education-like setting. The renovated high school and new middle school create a strong atmosphere for exceptional potential and growth,” said Brandon Biniker, an interior designer with Fanning Howey Associates, an integrated architecture, interiors and engineering firm that designed the new campus. Biniker said the design of the campus and the flexible collaboration studios fosters ongoing inspiration and creativity and allows students to take an active role in shaping their learning experience. Together the two school construction and renovation projects reportedly comprise the largest school construction enterprise in the city school system’s history. The district’s current middle school is scheduled for demolition, and was previously opened in 1923 as the former Middletown High School. The $96 million construction projects are reportedly being co-funded by Middletown residents who passed a $55 million bond issue and a 0.26-mill permanent improvement levy in a close ballot victory in 2014. That $55 million bond was later reportedly reduced to $45 million, saving taxpayers $10 million. According to district officials, the rest of the co-funding of the project will reportedly come from the Ohio Schools Facilities Commission. Construction of the new 135,000-square-foot middle school reportedly includes a learning pod infrastructure in each wing of the school, and additionally, a 2,200-seat arena that will be attached to both schools. George Long, business manager for the school system, told the Journal-News that the wings of the new school are separated into seventh and eighth grades and include shared learning pods outside of classrooms that are designed to better engage students. The Journal-News reports that the high school will feature some of the most digitally enhanced classrooms in the region, such as open-air learning pods, updated lighting, heating and cooling, improved building security, an expanded and upgraded cafeteria and kitchen, and a 200-seat community room to accommodate school and local organizations. Reports from the Journal-News contributed to this story.